In a remarkable letter to church members dated yesterday, Calvary Chapel Auckland (NZ) disclosed that the church severed ties with Gospel for Asia and GFA’s NZ office has closed. For approximately 17 years, Calvary Chapel Auckland has supported the work of Gospel for Asia which is now primarily The Believer’s Church. Originally there was close alignment between Calvary Chapels generally and the work of Gospel for Asia. However the organisational and ecclesiastical direction of Gospel for Asia has radically changed so that it is now antithetically different. We do not believe in transubstantiation (this is supposedly that the bread actually becomes the body of Jesus, and the cup actually becomes the blood of Jesus), total submission or focus to a man, calling the leader “father,” or Priest, taking a vow of total submission to that leader and his successor for life, or crossing ourselves in a liturgy. It is said that a picture speaks a thousand words so here are some photos, which visually depict some of the differences, but allude to many of the other contrasts that now exist: the metal image (used in Believers Churches, for all convocations, including countries other than India), the lighting of candles, the wearing of robes, etc.. 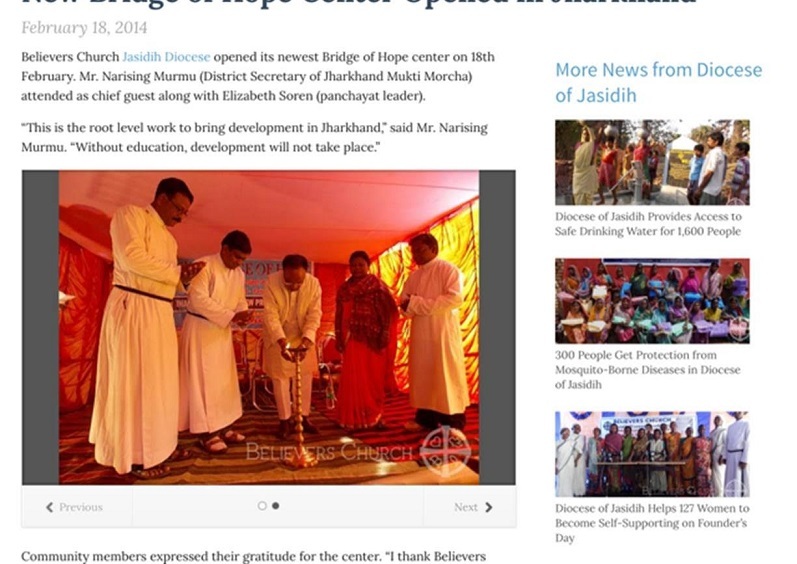 The photos below are from The Believer’s Church Website and Carmel Engineering College (Believers Church own and operate this) as identified in the heading. This group has amassed somewhere over $200,000,000.00 (one report says USD$250,000,000.00) US Dollars that are on deposit in India. They now have an Engineering University, own a Hospital, a Rubber Plantation and other businesses that generate from $35,000,000.00 – $70,000,000.00 US Dollars annually. The three Calvary Chapel Pastor’s who were on the GFA USA Board have all resigned after a lengthy investigation into the organization in many (if not all) of its various entities. Brian, Gina, and Andrew Malcolm have decided their season of serving – 12 years now, of sacrificial, dedicated service, has ended. The elders of Calvary Chapel Auckland have therefore decided to stop support for Gospel for Asia. The Gospel for Asia office upstairs at the church has closed down and existing supporters of GFA will soon receive a letter from them explaining the position and your options. We’ve been told KP Yohannan will write a letter but please understand in advance that it doesn’t alter our position here at Calvary Chapel Auckland, nor the greater Calvary Chapel family of churches. You are of course free to decide whether you want to continue supporting Gospel for Asia. Calvary Chapel Auckland is establishing our own missions budget (which almost every church has) and we are developing a clear and precise focus for outreach in New Zealand, the South Pacific through Calvary Chapel Radio (broadcasting now for over 10 years to Samoa, and more recently Rarotonga), and in other ways to spread the Gospel and help those in need in other countries. The letter told members that GFA has amassed as much as $250 million in India. Recently, former board member Gayle Erwin confirmed that figure to me as coming from the investigation conducted by the Evangelical Council for Financial Accountability. This means that GFA has added nearly $100 million since early 2013. A couple things you should know. We would never endanger students or anyone else, we’ve had pastors carry money, we’ve had staff carry money, we’re always looking for ways to get money into India because the reality is that it’s getting more difficult to do that, and we are looking for other ways that we’re able to do that. But we checked with our auditors before we ever would allow such a practice. We actually called Bland Garvey, they’re our audit firm and said this is what we’re planning to do, this is what we are intending to do, and they told us how we get it receipted they said it’s completely legal, you’re under all limits, you need to get receipts, there need to be receipts here, there need to be receipts there which Lori has receipts from here. I have spoken to several former GFA School of Discipleship students who carried cash to India. I have spoken to former GFA staff who carried cash and who knew others who carried cash. Now, I am calling on pastors and current staff to contact me privately to relate experiences of carrying cash to India. Click the link to email me with your story. Nothing will be published without your permission. I first wrote about this story on May 14, the same day GFA leaders were discussing the subject with staff. Many questions remain about why GFA did it and why they told staff that their auditor, Bland Garvey, told them it was legal. Bland Garvey has since resigned as GFA’s auditor. Pastors and others who carried cash could perhaps help provide some of the story that GFA has declined to share. Hope you enjoy this 33 Miles song with some acting by some teens who appear to be having a great time. For a more cerebral Thanksgiving read, check out the series from last year on Thanksgiving from the vantage point of several historian friends. The contributions of my distinguished colleagues John Wilsey, Jared Burkholder, Barry Hankins, Andrew Mitchell, Fred Beuttler, and Gary Scott Smith are well worth revisiting. Author Warren ThrockmortonPosted on November 25, 2015 Categories Believers Church, David Carroll, ECFA, Francis Chan, Gospel for Asia, K.P. 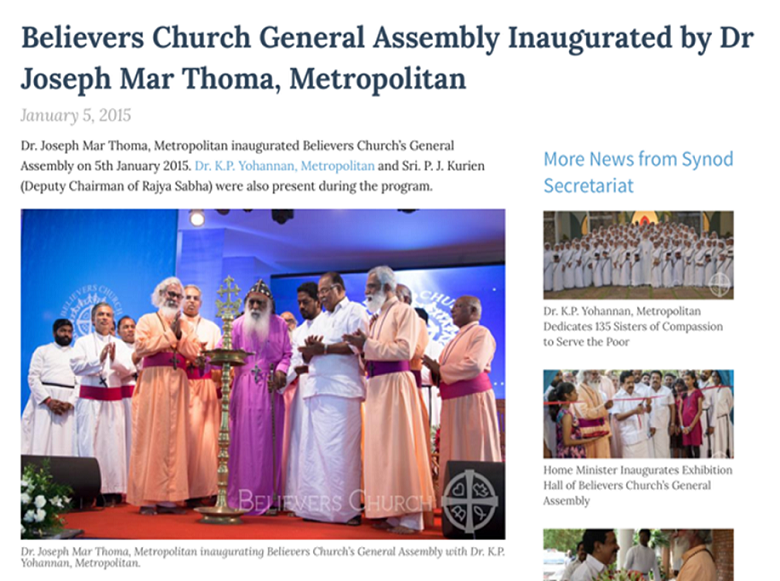 YohannanTags Believers' Church, Corpus Fund, Francis Chan, Gospel for Asia, K.P. 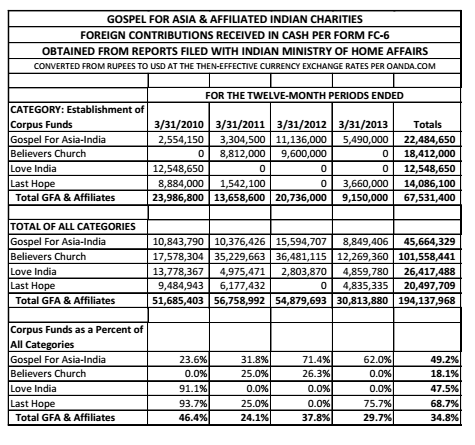 YohannanLeave a comment on Is Gospel for Asia's Indian Corpus Fund One Reason Why ECFA Terminated GFA's Membership? David Carroll: A couple things you should know. We would never endanger students or anyone else, we’ve had pastors carry money, we’ve had staff carry money, we’re always looking for ways to get money into India because the reality is that it’s getting more difficult to do that, and we are looking for other ways that we’re able to do that. But we checked with our auditors before we ever would allow such a practice. We actually called Bland Garvey, they’re our audit firm and said this is what we’re planning to do, this is what we are intending to do, and they told us how we get it receipted they said it’s completely legal, you’re under all limits, you need to get receipts, there need to be receipts here, there need to be receipts there which Lori has receipts from here. The Indian side also account for that money as received. If you were to lose it, they couldn’t receive it, and in that case, we would say it’s lost basically. We would have to tell the auditors we gave it and it didn’t get to the other side and I’m sure they wouldn’t be very happy, but is it receipted on the other side as received, and accounted for? Yes, it is on the other side of the pond. In essence Carroll and Yohannan claimed that carrying undeclared cash in groups was legal but GFA stopped it because the practice put too much emotional burden on staff and students. During last night’s Gospel for Asia segment on CBS 11 News Dallas, Carroll said the practice was stopped as soon as leaders found out it was illegal. In fairness to Carroll, his words were paraphrased by the reporter. “We have never willfully broken any laws,” said Carroll, adding that taking the cash-filled envelopes into India was an innocent mistake meant only to help the needy in that country. He said the practice was stopped once the group realized it violated federal law. “We just never knew … we maybe should have done a better job asking,” Carroll told the I-Team. Compare these words with what Carroll told staff. When and why did they stop sending cash via students to India? At one point, David Carroll told me flatly that GFA had not broken any laws and then declined to reply to my email requests for information. Perhaps, he should have taken my questions more seriously. According to the CBS report, the nearly $20 million diversion of funds from India to help build the Wills Point campus was given from the general fund of an Indian group. Several former members told the I-Team they also disagreed with GFA moving more than $19 million from India to finish paying off the new headquarters near the Kaufman County town of Wills Point. 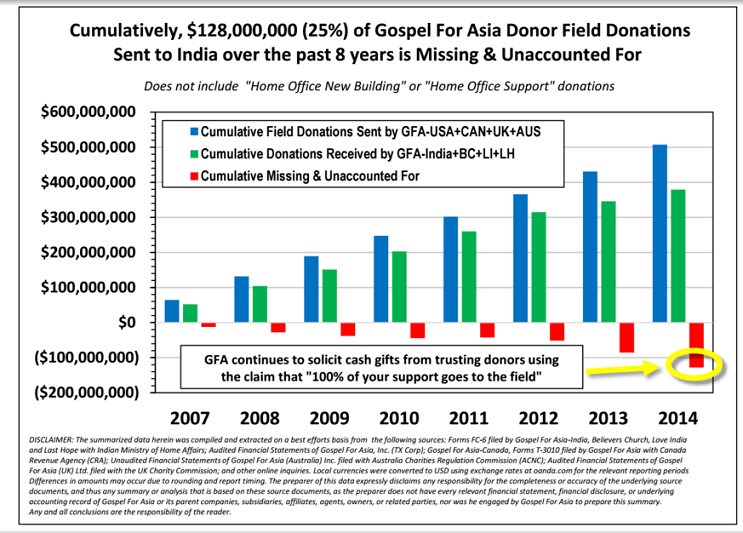 But Carroll responded by saying the Christian group did nothing wrong because the money came from a general fund that could be used for various purposes, and not just for work “in the mission field” in India. In May, Carroll and Yohannan told staff. David Carroll: There is, I don’t want to call it a rumor, a story, an inquiry about, what about the $19 million anonymous gift that was given for the campus back a year or so ago? What’s that all about? Did that come from the mission field, from field funds? So I want to explain that gift to you so that you know. In about April of 2013, as we were building the campus here, we were running pretty critically short on money. We went to a bank at the time, City Bank of Texas, they’re located in Lubbock. Many of you might remember, we were still at the other building and A group of 11 bankers came, talk about a room, 11 bankers and an accountant and John [Beers]. That’s 12 bankers and an accountant. That was a rip-roaring time. Anyway, um, they came interested in our project to loan to it. So we brought them out here, we showed them the whole thing, we explained our vision, and actually we were working toward finalizing that loan, we were at the place of getting terms from them and when we realized the cost of the loan, Brother KP mentioned it to some of the folks in Asia and mentioned that we were not able to do any better than that. We couldn’t, we would loved to have borrowed money from one of the Asian banks cause actually it’s much better terms, it would be much less costly, we weren’t able to do that being a foreign corporation. 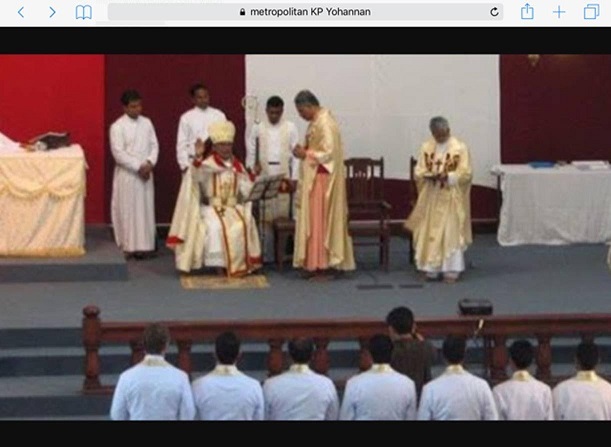 And so, what the people in Asia did, and it is a board that is under Believers’ Church umbrella, but Brother KP’s not on that board, it wasn’t his decision. The decision was made by them that since GFA North America had sent so much money to us from undesignated field funds, where needed most funds over the years, and since this campus to us is seen as an international headquarters which will be leadership training, it will be RYPs, which are always fruitful for the field, every time we have an RYP, the field tends to benefit from that. It will save the ministry somewhere between 4 and 5 million dollars a year when we’re at capacity here which is about 350 people. When that happens, we’re going to receive a lot of that extra money back and so they made the decision while we were in that bank loan process, that rather than go with that bank loan, we would like to make an anonymous gift for the campus fund. And they did that. DC – I was just getting to that. DC – That’s fine. No, it wasn’t. But what they did on the mission field is they actually took a loan from one of their sources to replace that money so they could use it for the purpose it had been designated for there. So in essence, they got our loan. There are several income producing entities in Asia. That’s why partly why we have 35% of our church is self-sustaining, by God’s grace now in Asia. And they felt they could pay that loan off very very quickly. They made that decision to give us that money and they wanted it to be anonymous. And I’m a little sad that it’s not anonymous, but I did want to explain to you where it came from, and the reasons behind it, and so, in their minds it was an investment. DC – It’s completely legal, thank you. There’s a board member, board documents as I understand it, I don’t live in Asia, but there’s board documents on the other side. The whole thing was done in complete legality. Was the nearly $20 million a transfer from Believers’ Church general fund or a loan taken out by BC or a BC affiliate? David Barton rarely lets an opportunity go by to bash President Obama. His response to Obama’s news conference on Syrian refugees is a case in point. When I hear folks say that, well, “Maybe we should just admit the Christians but not the Muslims” — when I hear political leaders suggesting that there would be a religious test for which person who’s fleeing from a war-torn country is admitted. . . that’s shameful. President Obama, once again, has completely rewritten the simple wording of the Constitution to make it say something it does not. As is evident from the clear wording above, the “religious test” clause applies only to federally elected and appointed officials, and that’s all. It does not apply to immigrants or anyone who does not hold federal office. And when I hear folks say that, well, maybe we should just admit the Christians but not the Muslims; when I hear political leaders suggesting that there would be a religious test for which a person who’s fleeing from a war-torn country is admitted, when some of those folks themselves come from families who benefitted from protection when they were fleeing political persecution — that’s shameful. That’s not American. That’s not who we are. We don’t have religious tests to our compassion. And if we want to be successful at defeating ISIL, that’s a good place to start — by not promoting that kind of ideology, that kind of attitude. In the same way that the Muslim community has an obligation not to in any way excuse anti-Western or anti-Christian sentiment, we have the same obligation as Christians. And we are — it is good to remember that the United States does not have a religious test, and we are a nation of many peoples of different faiths, which means that we show compassion to everybody. Those are the universal values we stand for. And that’s what my administration intends to stand for. Nowhere did Obama say that religious tests for refugees are unconstitutional. His reference to religious tests was a reference to a more general principle that America has historically valued freedom of conscience and equal treatment for all people. Even though Obama stuck up for equal treatment, he called on Muslims to address the radical elements which claim to speak for Islam. Now, what is also true is, is that the most vicious terrorist organizations at the moment are ones that claim to be speaking on behalf of true Muslims. And I do think that Muslims around the world — religious leaders, political leaders, ordinary people — have to ask very serious questions about how did these extremist ideologies take root, even if it’s only affecting a very small fraction of the population. It is real and it is dangerous. And it has built up over time, and with social media it has now accelerated. And so I think, on the one hand, non-Muslims cannot stereotype, but I also think the Muslim community has to think about how we make sure that children are not being infected with this twisted notion that somehow they can kill innocent people and that that is justified by religion. And to some degree, that is something that has to come from within the Muslim community itself. And I think there have been times where there has not been enough pushback against extremism. There’s been pushback — there are some who say, well, we don’t believe in violence, but are not as willing to challenge some of the extremist thoughts or rationales for why Muslims feel oppressed. And I think those ideas have to be challenged. Obama should be commended for calling Muslim leaders to lead the way in condemning violence perpetrated in the name of their religion. Instead, Barton strikes out on behalf of his favored GOP presidential candidate Ted Cruz by doing the very thing he accuses Obama of doing. The spot aired at 10pm cst and focused on invasive practices with staff, the cash smuggling to India, and the diversion of nearly $20 million from India to the construction of the Texas headquarters. A text version is here. It was shocking to hear David Carroll say the loss of ECFA membership was due to minor infractions. He also told CBS News that GFA stopped sending cash to India when they learned it was illegal. That is not at all what they told their staff in May. The teaser has been running all day according to Dallas area folks. The CBS 11 iTeam takes you inside a North Texas ministry that takes in millions of dollars of donations every year. Plus former members speak-out and their warning to you. I will post a link to the segment as soon as it becomes available. The link to CBS 11 News is here. Starbucks continues to take Christmas criticism from various quarters but I don’t think it is deserved. Donald Trump even wants to create a government register of every Red Cup, or something like that. I don’t visit the place often but when I did over the weekend, I felt positively festive. I got a tall Vanilla Bean frap and so I got a clear cup instead of The Red One. 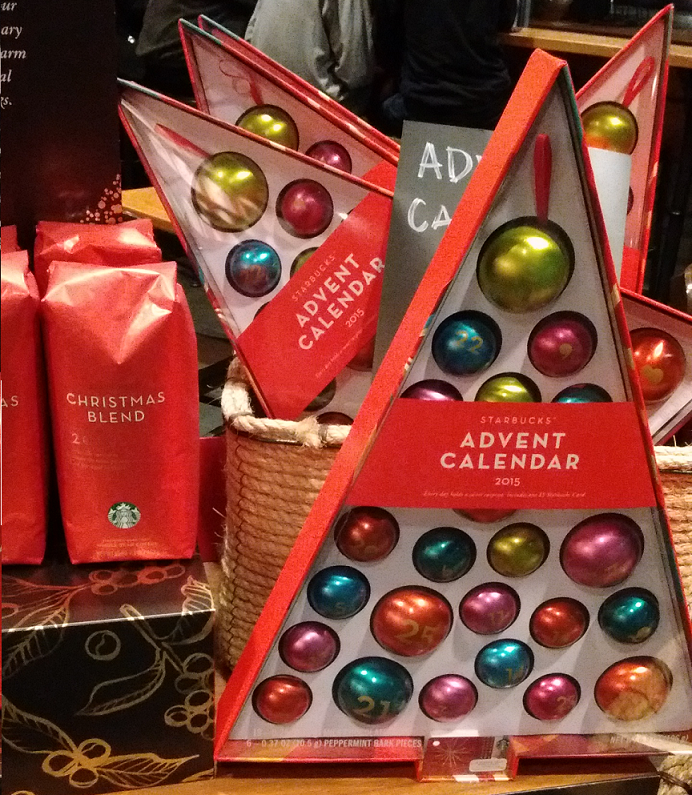 But I did notice that Starbucks is selling a Christmas coffee blend and markets an Advent product. Check it out. 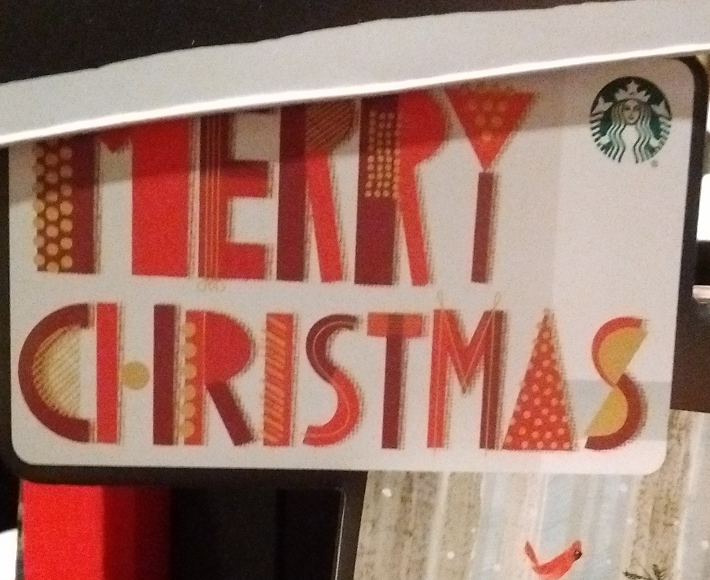 Seems like Starbucks is sending cleverly coded Christmas messages to their customers. I know what Advent means. Merry Christmas!? How could that be? I had to check my location to see where I was enjoying crushed vanilla ice and alternative music. Sure enough, I was still in Starbucks. Confused, I asked myself how can Starbucks be engaged in a war on Christmas with all of this Christmas stuff around? For a moment, I wondered if all of the Red Cups and references to Christmas and the Advent Code had lured me into some kind of trap from the pit of Seattle. I waited to see if anti-Christmas subliminal messages would bombard me from the sound system. I kept hearing the same music and names being called out by the baristas. While I waited, the most evil thing that happened was the temptation from the Christmasy-looking baked goods. I settled on the snowman doughnut and peppermint cake pop as souvenirs from the front line of the Christmas wars. All in all, the whole situation seemed pretty tame, just a business commercializing the Season, which may have been the point in the first place. This is an issue I have been raising since June. To date, no explanation has been offered for why the amount reported by GFA as being sent to India isn’t reported in India public documents. Even after nearly 6 months, I am receptive to an explanation from GFA. Thus far, there has been no answer. Obviously, this is a huge red flag and should be addressed by the GFA board and leadership. Note: The chart above replaced a similar chart in the original post. The captions have been expanded to make the explanation clearer. The figures are the same. Next year Mark Driscoll will speak at a one day you-can’t-live-without-it leadership conference for Perry Noble. Check out the conference description. Pastor Mark will be speaking at the Lead Conference hosted by Perry Noble. This one-day conference will be held at NewSpring Church in Anderson, South Carolina on March 3rd, 2016. This event is uniquely designed for leaders who want their teams and their organizations to succeed beyond their expectations. I just saw that Wenatchee the Hatchet wrote about this last week. He has some interesting things to say about it. Go check it out.